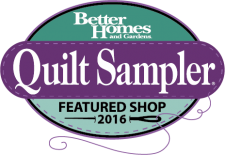 We have all kinds of items that make great gifts: Irons, Notions, Fat Quarters, Pre-Cuts, Thread, Pottery, Kits and more! Remember, Gift Certificates are the perfect choice for the person you don't know what to get. We've extended are Christmas Drawing until the close of business on Tuesday, so you will still have a chance to get entered into the drawing. For every $25.00 you spend you will be entered to win some fabulous prizes. We've been adding to the prize pile daily, the more we give away the less we will have to count for our end of year inventory!! We will send out an email with the list of winners. Then if you win you will have a gift waiting for you when we open back up on Friday, January 2nd. What a way to start the new year! If you haven't been following us on Facebook we have been invaded at the store by two of Santa's Elves who just happen to be an M&E too! 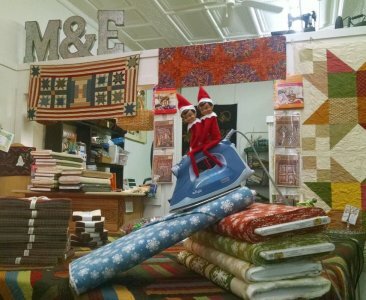 Merle & Earl have been having a lot of fun in the store these last few days. We thought you might like to see some pictures of what they have been up to! This is what we found Saturday when we arrived at the store. 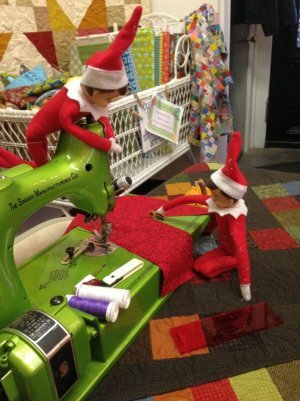 Two elves busy sewing away! We laughed when we found out their names were Merle & Earl! 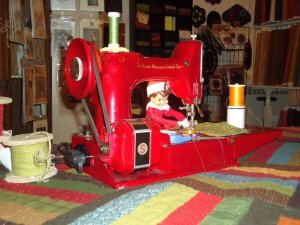 Earl was sewing away on Ethel's machine Miss Ruby. 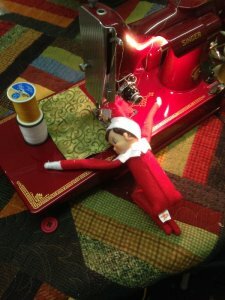 By the end of the day poor Earl was exhausted from all his sewing! Then we just happened to stop down to the store on Sunday and found them really goofing off! Snowflake fabric sure looks fun to sled down on doesn't it...LOL! 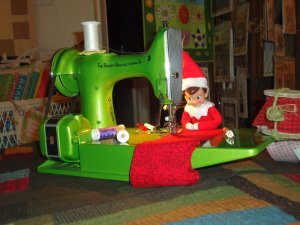 If you wanted an Oliso Iron for Christmas you'd better stop down and get it before Merle & Earl try and take them back to the North Pole with them. 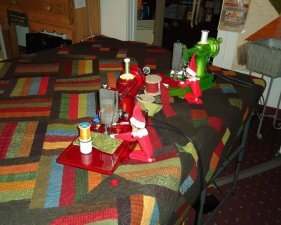 Who would of thought they would still be getting into mischief yet on Monday, but here you can see Merle was busy trying to get some work done whilte Earl was just goofing off. 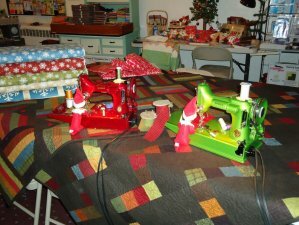 Don't you love Merle's little Olfa Rotary Cutter! They make great stocking stuffers if you need any. So if you want to see what the boys are up to on Tuesday, stop down at M&E. We will be here to help you with those last minute shopping needs. Reminder: We will be closed for the Holidays from Wednesday, December 24 - Thursday, January 1st. We will reopen again on Friday, January 2nd. Regular store hours.